Okay, after finding a spot for the cypress vine, it's now time to build a trellis. The vine would need some sort of support structure where it could twine around. Cypress Vine (Ipomoea Quamoclit) is a twining vine as opposed to clinging (Millionaire's Vine), creeping (Creeping Ivy) or sprawling (Bougainvillea) vines. So the support structure would need vertical members for it to grow upwards. A couple of ideas I had was to have wire screen or wire mesh for the trellis material. The common wire screen that's easily bought around here has 1" by 1" spacing which I felt was too small for the vines to easily get into. 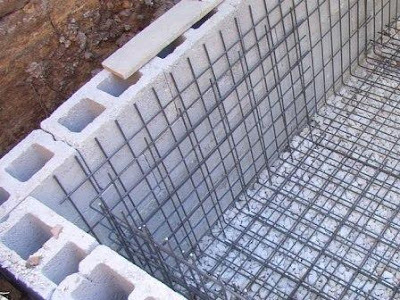 Steel mesh like the one used below (for construction purposes) has 2" by 2" spacing but is rather hard to work with and heavy. It's also difficult to procure (read: expensive) for just the purpose of trellising a small area. So for tellising material, I decided to use an old standby - thin insulated electric wires. They're thin, easy to cut and easy to work with for this project. But these thin wires would not be enough as they lack rigidity. So steel wires were used to create the frame on which these thin wires will be tied. Steel wire. You could use gauge 14 or thereabouts. This is rigid enough to form the frame of the trellis. Cypress Vines are not thick nor heavy vines. So this size is adequate. Masonry or concrete nails. The cypress vine is not a thick vine even in maturity so 1 or 2-inch masonry nails will be adequate to allow the vine branches to slip through the trellis. Thin electric wires. These will be tied to the steel wire and will form the lattice of the trellis. Paint. If you used different colored thin wires (as I have) you may want to paint them to a standard color. I also decided to paint the concrete post to white. The old finish was simply ugly. For tools, you only need a pair of pliers and a hammer. See Part 2 of this 2-part series on how to assemble the trellis with the simple tools and materials outlined above.